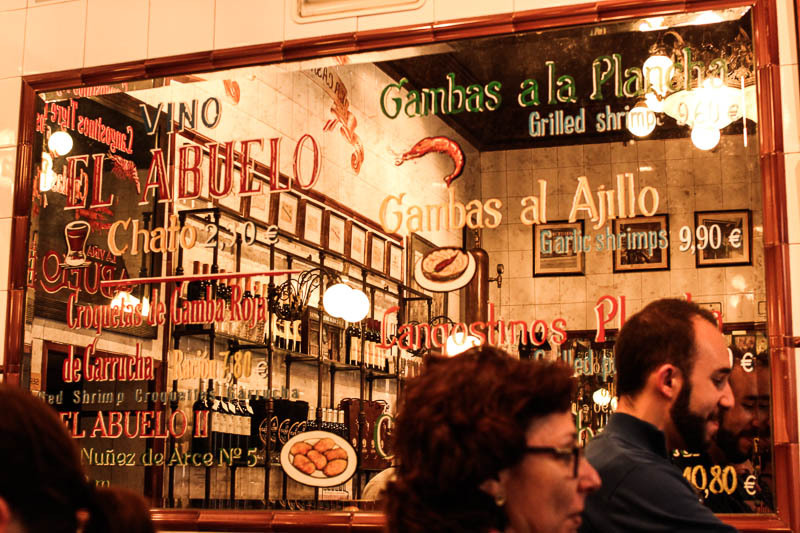 Time in Spain was an immersion course in tapas language also. Tapas (or pinchox) culture is definitely not what I am used to. The usual night out to drink for me normally goes something like this: Find a good place that serves tasty mezes (Turkish version of tapas, I guess), sit around a table dotted with lots of little plates, drink slowly and eat slowly, enjoy a long night around a table. 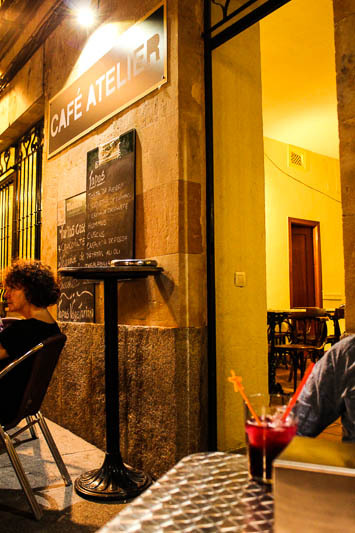 In Spain, I got used to tapas bar hopping, one tapa and caña con limon here, one tapa and wine at another place. Got used to eating and drinking on my feet by the bar, then moving onto another place with friends. 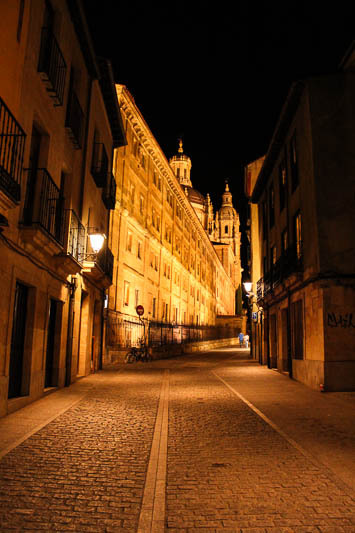 Salamanca also made it doable because it is such a small and walkable city. One thing I learned was that you judge the place by the napkins thrown on the floor sometimes. If there are napkin piles on the floor, then we would walk in there to eat something. 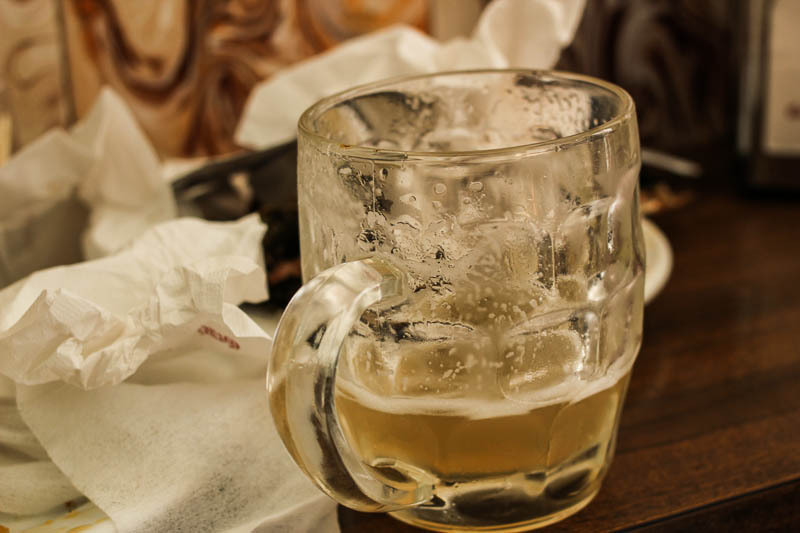 Another new thing for me was the beer-lemon soda mixture. Caña con limon, a mixture of Pilsner style light beer on tap and lemon soda, is a simple refresher and I really enjoy it, especially on a hot summer night. Some beer enthusiast might look down on the concept but I think it is a clever way to make the alcohol intake possible in a hot climate. On the wine side, there are two regional wines, Rioja and Ribera. I found Ribera is smoother and easier to drink. Or on headache level, Rioja gives me more headache than Ribera did. I can say this as scientific statement since I have enough data points! One thing the menu lacks was the variety of vegetarian options. 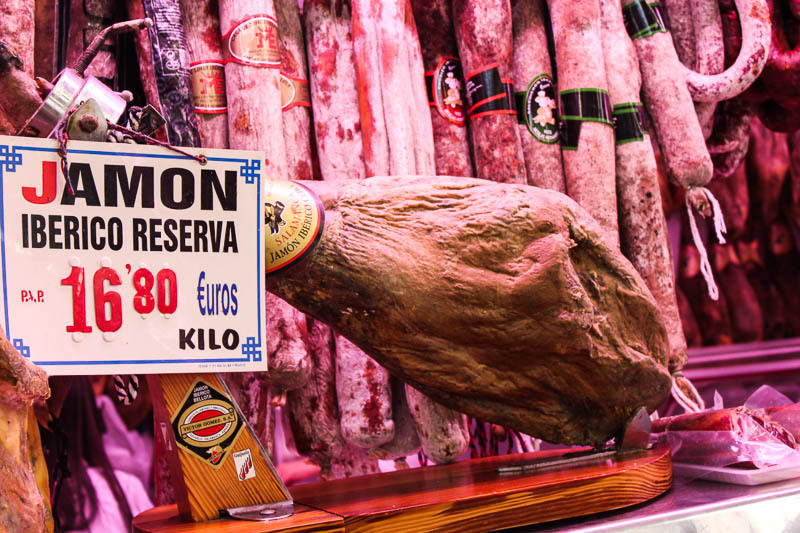 Everywhere is full of jamon, chorizo, and variety of sausage products or beef. 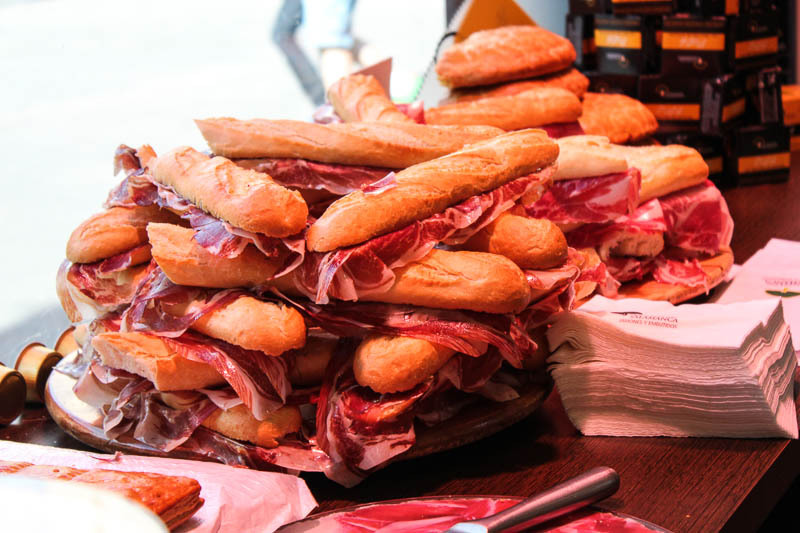 Especially in Salamanca, where the famous jamon iberico bellota is their pride, it is hard to eat anything without meat in it. And it is not allowed to bring it into US – which I think it is a cruel decision- so I had to eat it there and then, whenever I had a chance. 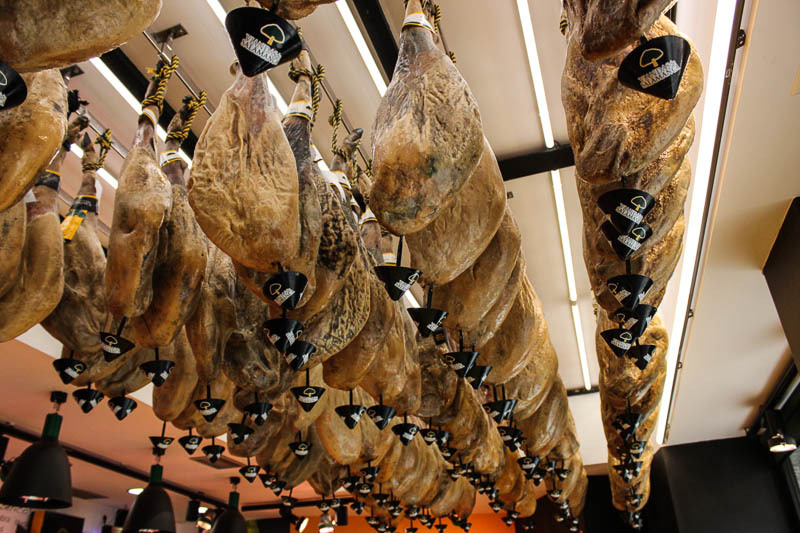 There are shops selling nothing but jamon and derivatives, it was always fun to visit these shops. On the vegetarian side, we were able to find a little café called Café Atelier. All-vegetarian menu was so delicious, we did not mind eating there often and hanging out. 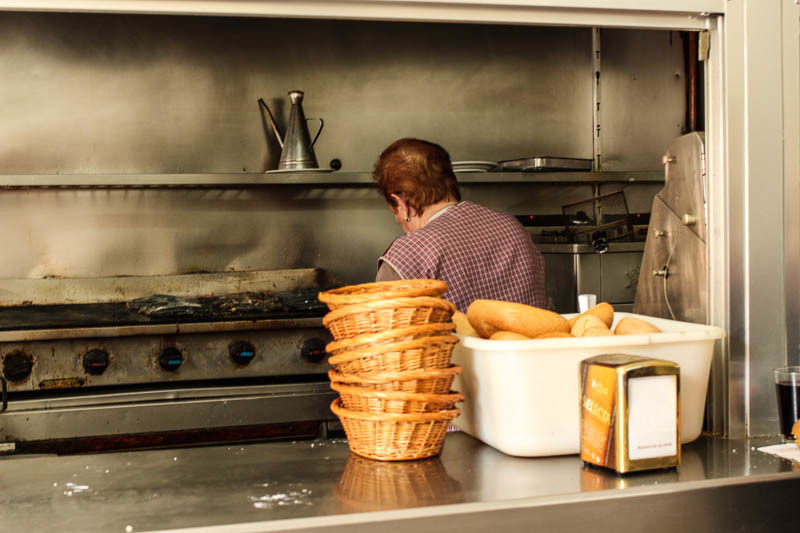 Especially, patatas a la importancia that they make was a comfort food for me. And the view of the little, narrow street while sitting outside entices you to order one glass of wine after another. We happen to spend two weekends in Madrid. 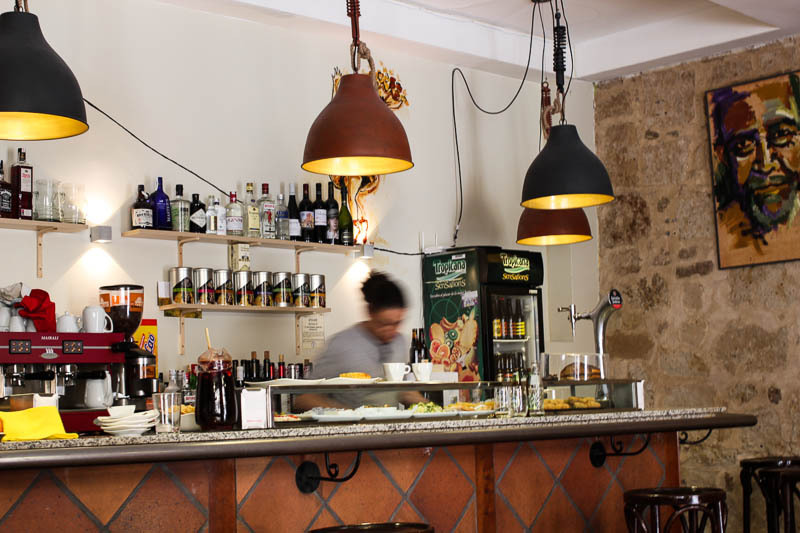 It has enormous number of restaurants and a lot more ground to cover than Salamanca. Needed some guidance. I was lucky to find MadridChow and took his recommendations to the heart. 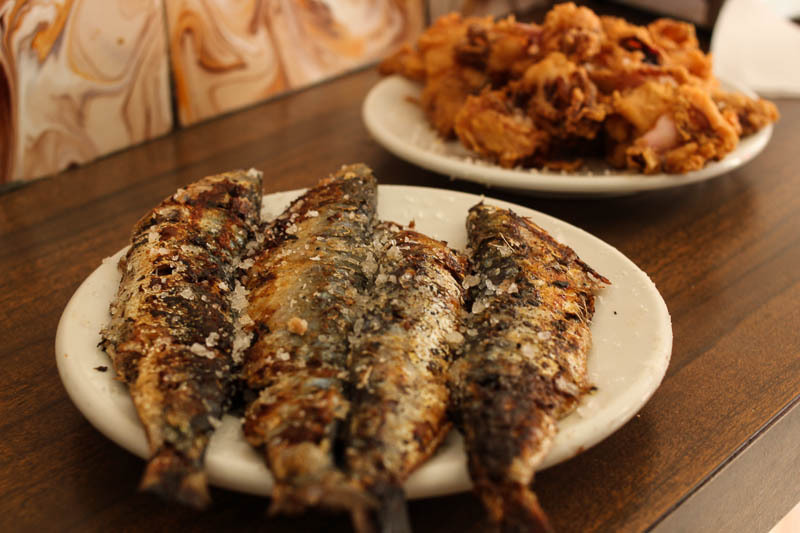 Definitely, Bar Santurce with their sardines topped with rock salt was my favorite. El Abuelo had some delicious (and pricey) garlic with shrimp. 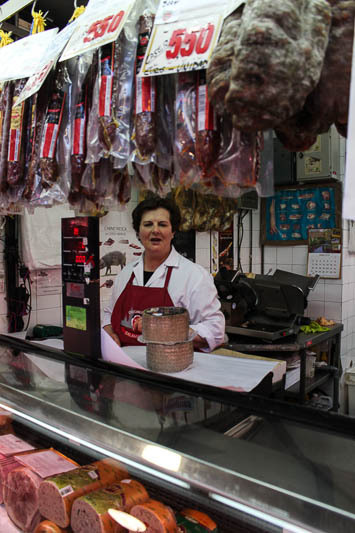 Mercado De La Reina is another place that was worth the time. It had some good fried artichokes served with romesco sauce, fried calamari and pimientos de padron. Their mojito made with dark rum was one of the best I have had. Got to eat loads of manchego cheese which is another special thing for the region. It is different everywhere since everyone was serving one with different ages. Goes well with walnuts, almonds, figs and quince marmalade. Since it is allowed by the Customs, I loaded my suitcase with 2 kilos of cheese and dragged through airports. Wish I had more room to take more with me! 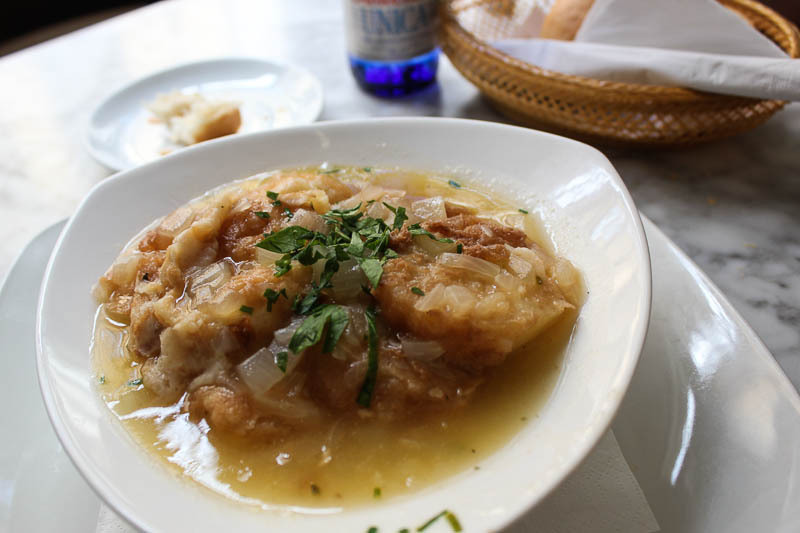 After three months of eating, drinking and shopping at mercados, I can say that I do not have “I wish I had eaten X” for Castilla-Leon region. There is still a lot more in Spain. All in good time. Wonderful to hear about your trip! 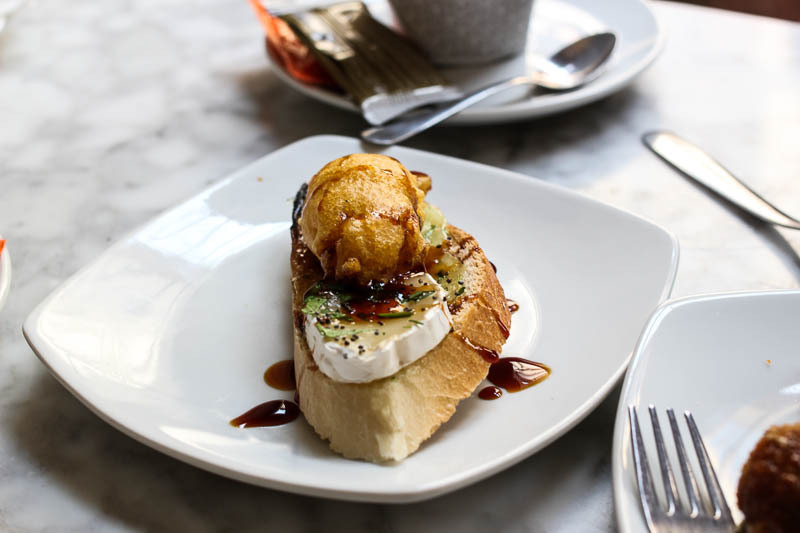 Going from tapas bar to tapas would be interesting indeed. I would probably also like the beer/lemon soda mixture. At least, I would like to try it! I also learned on my recent travels how many things cannot come into the U.S. I kind of like that there are foods to discover that we know little about over here. Have a fantastic time on your travels. Loved reading this post. Looks like you had lots of fun. I would have probably brought a suitcase full of Manchego! Love it! 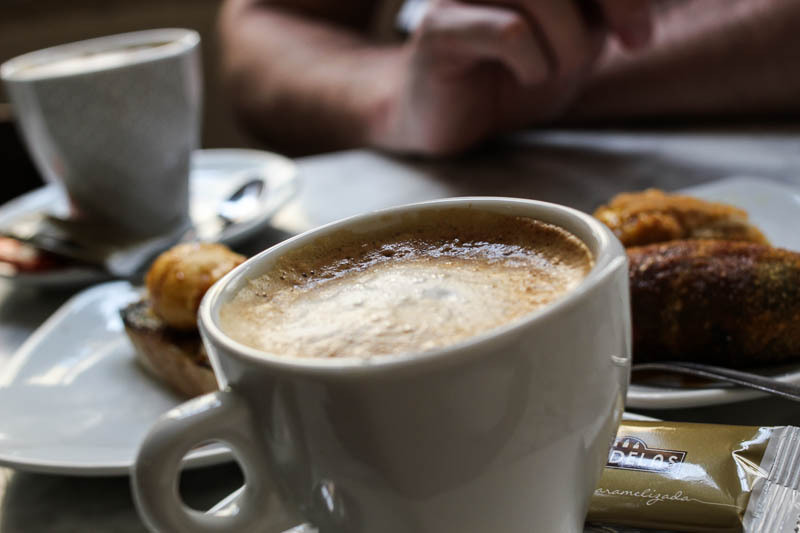 I just treated myself to an afternoon cup of coffee and some Ilke catch-up! What a pleasure to read your words and see your pictures. I have missed you much! Thanks for the lovely break in my day! I will be in Spain in September. You’ve given me a lot to look forward to! I could’t agree more…Great post, beautiful places and pictures! It sounds like a food paradise :-)) Those sandwiches look so very inviting! i am so envious of your time in spain, did you also pick up on/more of the language? that plate of sardines looks divine! hope you are well in Turkey! Fun post! I spend a week or so in Spain more years ago than I care to remember, and I loved it. Wonderful food! I need to get back there — thanks.